It's hard to pick a stone fruit favorite. A perfect peach is so vividly flavored it needs no adornment. Though my loyalty might lie with a ripe nectarine, with its nearly fudgy texture and sweet-tangy flavor (and none of that fuzz.) And this year, I've also been really impressed by the plums and pluots at my local market: floral, vanilla-tinged and sweet. So I've been eating my fill, and baking up cobblers aplenty. 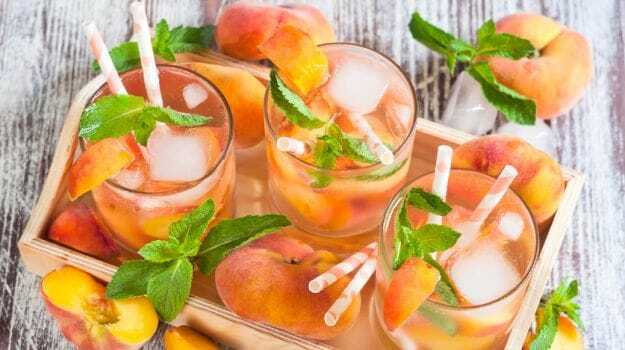 Ripe peach makes for a delicious caipirinha. For Rooibos Tea Syrup: Pour boiling water over tea bags and let steep 5 minutes. Remove tea bags. Stir in sugar to dissolve. Let cool before using. Syrup can be stored in refrigerator for up to 1 week. In a mixing glass, muddle peach slices, rooibos syrup, and lemon juice into a rough pulp. Add cognac and Lillet blanc, stir to mix. Pour unstrained into serving glass. Fill serving glass with crushed ice, garnish with large bunch of mint. 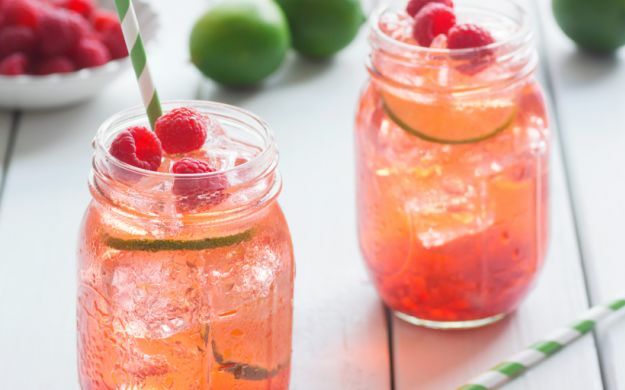 With spring in the rear-view mirror and temperatures rising, it's time to add some cool, refreshing drinks to your summertime arsenal. And if any drink was made for laid back sipping on a porch in the sweltering heat, it's iced tea. 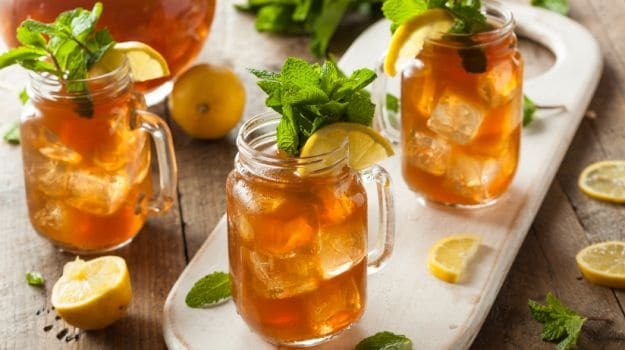 Legend has it, iced tea was invented during the St. Louis World’s Fair in Missouri, back in 1904. A tea plantation owner modified his product to beat the heat by pouring his regular tea through iced pipes, and the rest is history. Tea is already one of the best things you can slurp on, enriched with antioxidants(known as flavonoids), helps boosts immunity, increase your metabolism and gives you a burst of energy. How’s that for sweet? Just like Frances Hoarding rightly put, "Tea is the magic key to the vault where my brain is kept”. And iced tea? It’s like sunshine in a glass. 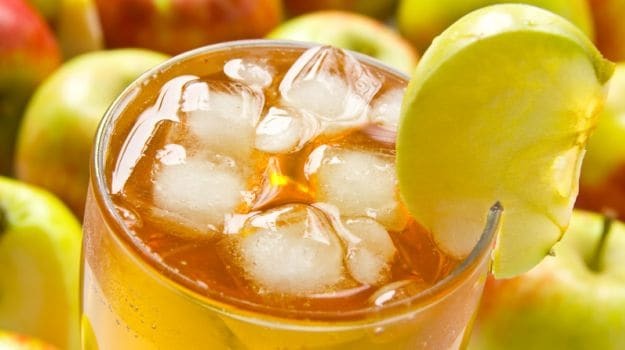 "The secret to making great iced tea is to use great quality tea. And while we've all grown up slurping on lemon and peach iced teas, there is so much more to explore", says Chef Jaydeep Mukherjee, Indigo Delicatessen, New Delhi. Many small boutiques and cafes are experiment with exotic tea blends, and going beyond the traditional black tea leaves. "Use whole lead teas, single origin teas, organic teas and serve chilled. I wouldn’t do so much as add a herb to them – just as is – chilled! Maybe sweetened and served with a twist of lime, that’s it! ", says Chef Jaydeep. Think: White tea with a kiss of rose or acai-mango or raspberry-mint or lemongrass-marigold. 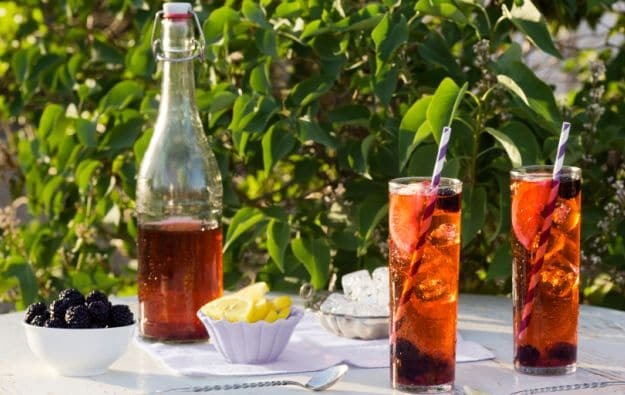 Garnishes, brewing methods, sweeteners and add-ins make it really easy to step up your iced tea game this summer, and even help transform iced tea into the ideal mocktail (or cocktail) for outdoor parties. Executive Sous Chef Mukesh Sharma, The Westin Hyderabad Mindspace, says "I love to play around with flavours when it comes to iced tea and include ingredients such as Kaffir Lime and Orange Zest, Blackberry and Basil, Lime and Lavender, even Lemongrass and Honey for added flavour". Mr. Amit Anand, Owner of Mingle Tea says, “A brew of Orange and Mint Green Tea works beautifully as an iced tea for the summer. Not only are oranges packed with high levels of vitamin C, but mint helps you cool down. You can blend it with some soda, a splash of lime, a spoonful of honey and voila! Even a pitcher of Pineapple and Vanilla Iced Tea is really refreshing. It’s black tea, and makes for a brilliant concoction especially if you add a dash of lemon juice”. The best thing about making your iced tea is limiting the amount of sweetener you add (or not adding any), sans the chemicals. And these cold infusions make for a great solution for people who avoid drinking a hot cuppa. 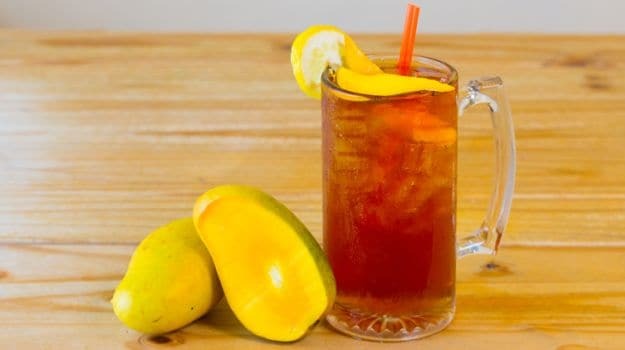 Now if you believe that nothing screams summer quite like mangoes, you’ll love this gorgeous Peach and Mango Iced Tea recipe, with a White Tea base. It’s really simple, tastes divine (and makes for a perfect picture). Did you know: Studies suggest that White Tea may have the highest levels of antioxidants as compared to all other types of tea? You’re in for a treat. 1. Boil water in a large saucepan, and remove from heat. 2. Steep the white tea bags for about 7 minutes, then transfer tea to a large mixing bowl. Allow the tea to cool down for 30 minutes approximately. 3. In the meanwhile, mix chopped peaches, mango, and 1 tablespoon honey (to taste) in a smaller mixing bowl. 4. Then transfer the fruits to a large pitcher, and pour the cooled tea into the pitcher. 5. Stir to combine, chill in the refrigerator and serve over ice. 1. Bring water to a boil, and then remove from fire to cool. 2. Then add the tea leaves to a large pot and allow to steep for 4-5 minutes. 3. Strain tea into a clean jug and hold in a deep freezer. 4. Add honey, lime juice and zest from 1 lime to the tea. 6. Add iced water (sans the ice) to the tea to make enough for 4 glasses and also to dilute the tea which would otherwise be very intensely flavoured. 7. Add mangoes and mint to the chilled tea and serve in tall glasses. “To make Thai Iced Tea, all you need to do is add 2 tablespoons coconut milk and 1 tablespoon condensed milk to a regular glass of iced tea. If you want to make it boozy, add a splash of coconut rum or spiced rum”, says Home-Chef Malini Sawhney. If you have an upset stomach, brew some peppermint tea to ease gastrointestinal distress. You can even throw in some freshly sliced ginger to speed up your recovery. “Contrary to popular belief, Chilli Chai which is a strong black tea works well for the summers too. With small pieces of chilli and a tangy aftertaste, it’s one of my favourites. After all, darker teas yield a stronger flavour. You can also add a kick of lemon juice for good measure”, adds Mr. Amit Anand. If you love a mean Old Fashioned (I sure do! ), spruce up your tall glass of iced tea with 2 tablespoons of your go-to bourbon and 1 tablespoon of maple syrup (to taste). Stir well and serve with a slice of orange or maraschino cherry. You can even tag team it with 2-3 drops of Angostura bitters. Got some Chamomile tea bags lying in your pantry? Keep scrolling. 1. Boil water and remove from heat. Add chamomile tea bags and let it steep for 8-10 minutes. 2. Throw in some mint leaves, jasmine and juice of 1 lemon. 3. Pour into a glass over some ice. Top it off with apple juice and serve chilled. To start with, you need to brew a pitcher of regular iced tea. Boil 8 cups of water over medium-high heat. Add 6-8 tea bags of your choice, depending on how strong you like your tea. Let it steep for 8-10 minutes, then remove the bags and let the tea cool to room temperature before pouring it into an ice-filled pitcher. Here’s a scrumptiously simple recipe and 5 quick tips you need to know. 1. Steep tea bags for 10 minutes only, else the tea ends up turning bitter. 2. “The temperature at which you brew teas is really important. If you brew teas that need cooler temperatures with boiling water, the result could be bitter”, adds Mr. Amit Anand, Owner of Mingle Tea. To brew black and darker-coloured oolong teas, use boiling water. But for green, white and lighter oolong teas, use cooler water (around 170 to 180 degrees). 3. Add a sweetener (preferably honey) when the tea is warm so it dissolves easily and evenly. 4. Wait until the tea has cooled down to room temperature before refrigerating. 5. You can always make a little more than you think you’ll need, and keep it in the fridge. But not for too long. It’s highly recommended to drink it within 24 to 48 hours if stored in a sealed container so that it doesn't risk taking on the flavor of other items in your fridge. Note: When life hands you lemons, add a slice to your iced tea. So, what are you waiting for? We're up for another tall glass of iced tea already! Add 3 tablespoons white sugar, 3 tablespoons dipping water, 1/2 lemon juice, and 150ml earl gray tea, mix well and shake well. Excavation dug for water vapors have ice, half the lemon slices left thin for generous.